Digitek, an Indian market leader in Photographic & Smartphone accessories, has launched the Trolley Bluetooth Speaker DBS-200. The stylish and portable wireless stereo speaker is especially meant for social gatherings, parties, and outdoor entertainment. With unparalleled sound quality and astounding battery backup, the powerful Bluetooth speaker makes it a much-wanted gadget that adds melody to the celebrations. 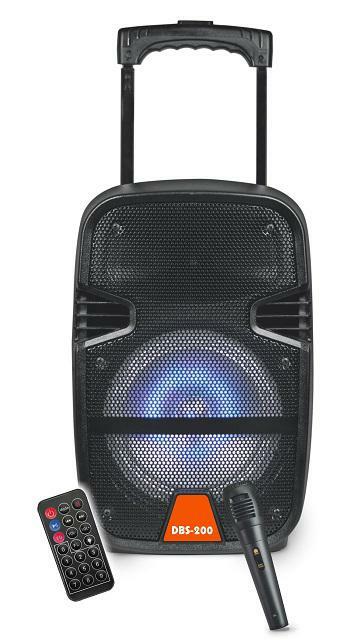 The 8” woofer sized device is equipped with a 400W PMPO and can be connected with two speakers at a time. The gadget can be paired with Bluetooth enabled devices within a range of 10 m.
Users can enjoy karaoke with the included mic, they can listen to FM radio or even play mp3 music by connecting the music source to the USB port or by using TF/SD cards on the device. The Bluetooth speaker has an inbuilt 3000mAh rechargeable Lithium battery for ops strong performance. The Aux input can be used to connect to other devices to amplify the sound and polish its quality.